My purpose is not to retell Lowery’s story, which you can read in the link below this paragraph. My intention, rather, is to confront the hiding of it. By steering their $ 480,000 into the Boston Mayor race via a New Jersey PAC, in which state disclosure of donors is not required, the AFT kept hidden what it felt it needed to hide. The same was true of the Boston Teachers’ Union, which didn’t issue an endorsement of Marty Walsh until the morning of election day, too late for news media to make the voting public aware. Why the hiding ? Clearly these teachers’ unions felt that if their active involvement in a Boston mayor’s race were known , Boston’s 57,000 public school parents — and surely others — would not like it. These unions know that there’s scant public support for their agenda. Yet they were willing to hide in the shadows for the sake of electing as Mayor a man who sits on a charter school board — which teachers’ unions profess to hate — but who is known to be a friend of unions and a go-slow collaborator who would likely not shake too many peaches off the peachtrees, in preference to a committed “school transformer” who actually sends his kids to a public school and who wanted much better than the status quo. All year long the teachers unions have demonstrated their unwillingness to accord any school reform measures but their own. For them it has been “our way or the highway.” Thus the hiding; because school parents, curriculum developers, and Massachusetts’s state government have other ideas about how to improve schools than the teachers unions do and have more than sufficient public support to override the inflexibility of the teachers’ unions; and these unions know it, and thus the subterfuge, to evade the spotlight. Bad enough when political campaigns do it. Despicable when done by people to whom we entrust the education of our children. To circle the wagons around their own agenda, teachers’ organizations were ready to see a Mayor elected whose prospects are incremental at best, a mayor who is too deecnt a guy and too collaborative to force the hard decisions, instead of pursuing real reform by a Mayor candidate who understood that the future will not be like the past and who had solid ideas — and the intelligent fortitude and talented support group — on how to get his city there. To circle the wagons and do it under the table, like a worker trying to avoid paying taxes. I call it dishonorable. There was a time when teachers were reformers; embraced experiment; proposed new curricula and new school arrangements. Most teachers still understand very clearly that it is NOT about THEM, it’s about educating children. Unfortunately, the teachers’ organization that invaded the Mayor’s race unannounded “because they are fighting for working families,” no less, failed to get that message. For these groups, it was indeed all about them. 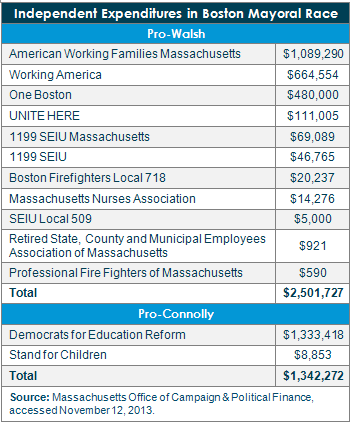 The Boston Teachers Union (BTU) had an opportunity, early in the race, to embrace the candidacy of John Connolly, which had made education the number one issue, and to discuss with him how to best reshape the public schools to be beneficial to the future economy and society. That would have been a superb exercise in reform that the voting public would surely have welcomed. Instead, the BTU chose to retrench, to demonize Connolly, to support a man they didn’t want to support, and to do so by last-minute ambush. But I do not blame the BTU as profoundly as I do the AFT. The BTU’s resistance to reforms not advocated by it was well publicized even if their election-morning endorsement wasn’t. The AFT chose to hide behind the curtain, like Polonius, and to lob a $ 480,000 bomb into the arena. It shouldn’t be surprised if it now finds itself poignarded by a host of Boston School Parents who have other ideas about school reform and who resent being ambushed by refuseniks.